Dr. Zhou truly believes that exceptional dentistry requires a lifelong commitment to education. Prior to establishing Peartree Dental Care, he completed hundreds of hours of continuing education courses and seminars in all areas of dentistry. He is proud to offer his patients the most advanced and comprehensive care possible, especially smile-transforming treatments like dental implants and Invisalign® aligner therapy. Dr. Zhou also stays up-to-date on new technologies and is frequently at the forefront of implementing advanced techniques and equipment into routine dental services. One of his favorite new technologies is digital imaging, which allows patients to "preview" their smile transformation before any treatment begins. Dr. Zhou also employs low-radiation digital X-rays, precise intraoral imaging, and sophisticated laser dentistry in order to provide the most comfortable, conservative, and efficient care possible. Dr. Zhou is a member of the American Dental Association, the Maryland State Dental Association, and numerous local study groups and associations. When he's not practicing his passion of dentistry, you'll find Dr. Zhou spending valuable time with his family and friends. He also enjoys fishing, golfing, and of course, cheering for the Baltimore Ravens. At Peartree Dental, we treat every patient with trust, respect, and compassion. 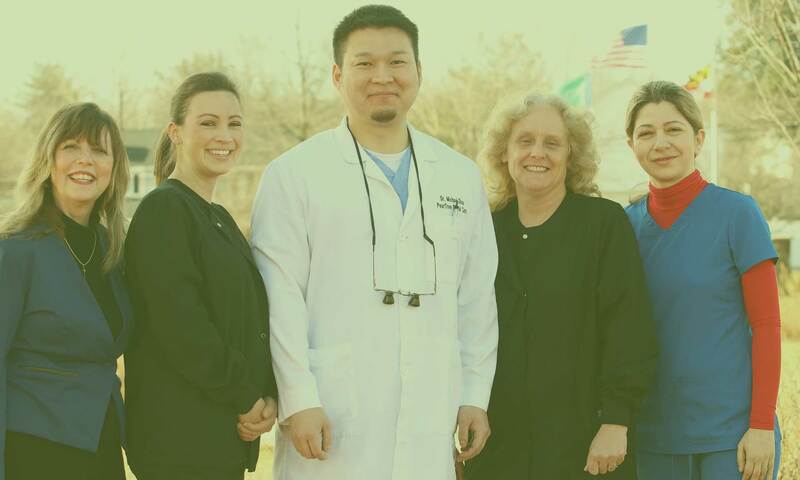 Our educated and experienced team has been providing quality dental care for residents of Ellicott City for nearly 11 years. Our patients are like our extended family, and we've designed every aspect of our practice to show it. At Peartree Dental, we accept most dental insurance plans and will gladly file and track your claims to save you the hassle. If you don’t have insurance, you can visit our payment page to learn about our other flexible and accommodating payment options. We surpass ADA and OSHA recommended standards to make our Ellicott City dental office a clean and safe place for your family. Before your visit, we thoroughly sanitize each treatment room and disinfect every piece of equipment using state-of-the-art sterilization technology. We also perform routine spore testing through an independent third-party laboratory to ensure that all of our sterilization equipment is working properly. Unlike most dental practices, we welcome walk-in appointments and always save room in our daily schedule to accommodate them. Walk-ins are especially helpful in the case of dental emergencies, because no one plans for a broken filling or a chipped tooth. We've also tailored our normal scheduling policy to make it easier for you to fit dental visits into your busy life. Our friendly and flexible team will work with you to book appointments that don't interfere with work, school, or family time.